The Mynah bird that kept saying “Good morning! …Pangit…ang pangit mo [ugly, you are ugly]!” was somehow invading my deep slumber. Realizing, that it was not a dream but the talking Mynah bird at the hotel courtyard signalling the guests that morning has come, I quickly jumped from the bed to check my alarm. It was 7:08am and I overslept! Without skipping a heartbeat, I jumped into the shower and quickly dressed. Never minding to comb my hair, I quickly went to the hotel lobby to meet my team mates. Engineer Rene Brasuela and Mariano “Yano” Grifalda were waiting patiently for me at the lobby. Our call time was 7:00 am and I was half an hour late! Yano turned and reminded me “Maam, hindi ka pa nagsusuklay…[you haven’t brushed your hair] …” I quickly dismissed that comment and said, “Yes, I know…sa van nalang…[will do it at the van]” We proceeded to our waiting van and made our way to Maragusan, the summer capital of Compostela Valley for our field monitoring visits. One of the PTA volunteers from Sapawan Elementary School asked us “magkakaroon din po ba kami ng bagong school building?” [“will we also have a new school building”] Kuya Rene, as we fondly call him responded “Yes, kayalang since may Memorandum of Agreement (MOA) and DepED with the LGU, hinihintay pa ang LGU counterpart bago mag umpisa” [“yes, but since DepED has a MOA with the LGU, they are still waiting for the LGU counterpart”]. The PTA President asked if we wanted to visit Sapawan Elementary School and I asked how far it is from New Albay. The response we got was that it was only a kilometre and a half from where we were and the PTA President pointed in the direction of mountain. I jokingly said “do we have to push the van again to get across any river?” Kuya Delo said that we do not. There was a brief sigh of relief from our end. 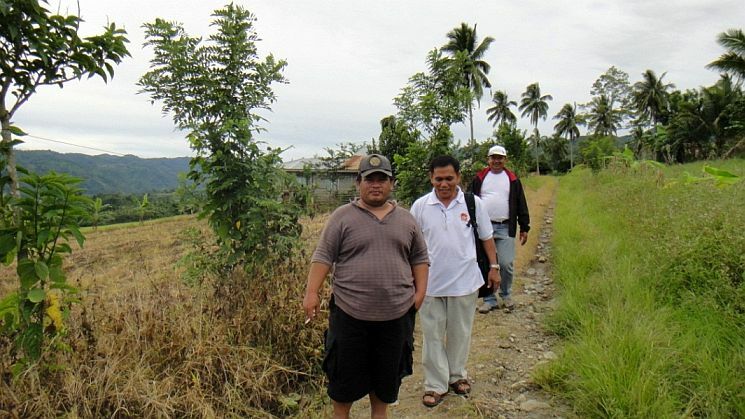 However, kuya Delo said that the van could only reach a certain point and we would have to walk all the way. The adventure continues. Together with the PTA volunteers, we then proceeded to our next destination – Sapawan Elementary School. We hiked from the point where the van could no longer pass. I could see a small brook up the road and we had to stand on rocks, hopping and jumping from one rock to the other, making sure that our steps (and small leaps) are well calculated. 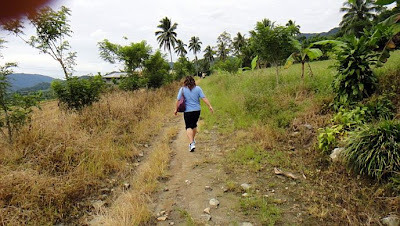 Up the beaten path, we still maintained our course until we came across a one-storey concrete structure that was oddly misplaced amidst the picturesque landscape. We had reached the school. The PTA President introduced us to the Teacher- In-Charge (happened to be his wife as well) of the school and explained briefly to her the beginning inventory activity that we would be conducting. 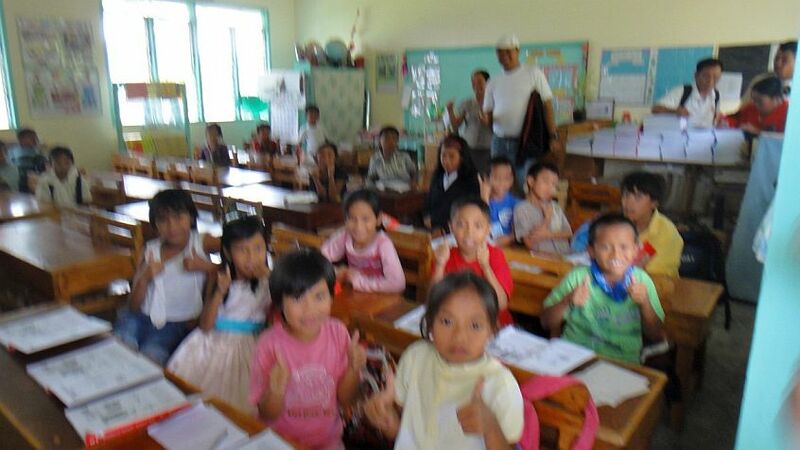 We went into the first classroom and saw that the desks were in relatively good condition. 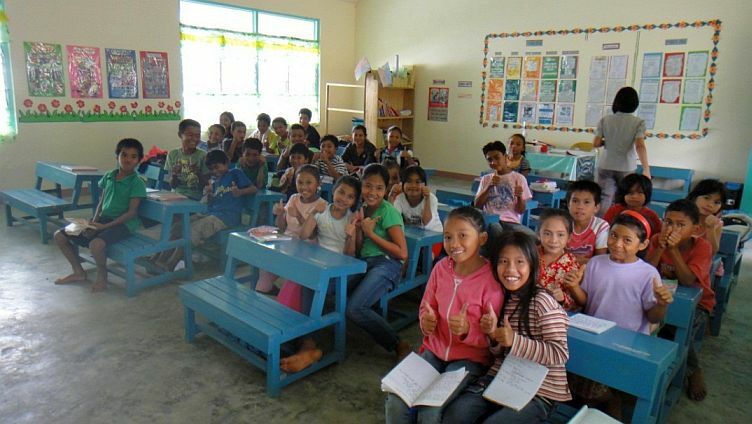 The desks were not from the DepED but from the LGU. I took notice of the varying age groups of the students and asked the teacher what grade level she was teaching. She responded “multi-level poi to…may preschool, may grade 1 at may grade 3” [“this is a multi-level classroom – we have pre-schoolers, grade 1 and grade 3 students in this classroom”]. I couldn’t believe what I was hearing but more importantly could not begin to fathom the hard work and dedication these teachers put in their visual devices, lesson plan and not to mention dealing with the varying degrees of interests and attention these kids have during the day. The two teachers in this school had to prepare three sets of lesson plans, three sets of activities and visual devices, which they do tirelessly every day. They are amazing, simply amazing people! When we finished conducting the beginning inventory, the teachers and students were so thankful to us for visiting and recording the data on the school furniture. We signed our names in the visitors log book and found our names to be the first ones to visit their school. The teacher in charge commended our efforts in visiting their school and hoped that through the monitoring efforts we could relay their condition to the higher ups within DepED. I asked the school teacher what motivates her to wake up each day to teach these young minds. She told us that it is not easy coming to school every day given the location of the school but she gets her strength and motivation from the children that want to learn. She informed me that the children are mostly Mansaka (tribe) and for quite some time, the parents do not see the value of sending their children to school especially when the school was still situated in the lowland. The kids had to travel 2 kilometres just to get to school. The distance dissuaded the parents to send their children to school. Because the school is nearer their communities, more and more children attend the school. In fact, the school began to offer Grade 6 class in June. Remarkably, the children at this school hardly speak Bisaya but are good in English. The teachers encourage the children to speak in English rather than the native tongue or Bisaya. In a sense, I think it is a good learning ground to teach the kids a more universal language to equip them in a competitive world. This new experience going to a remote school at the (literally) side of the mountain was an eye opener to me. 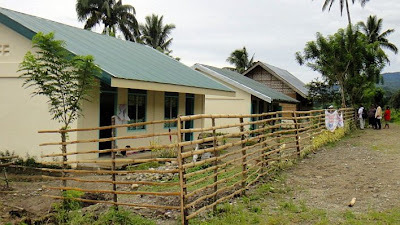 While there have been news and stories about ghost teachers in some areas in Mindanao, it is heart-warming to see that teachers still take their role and task seriously which is to educate the young. We take home with us the notion that if everyone really tries – teachers and school administration, parents and civil society alike could really forge a meaningful collaboration for reform in education. This is truly the essence of governance in the CORE project. Ms. Maria Caroline R. Belisario is Executive Director of Diaspora for Good Governance (D4G2) and Chairperson, Philippine Procurement Network.